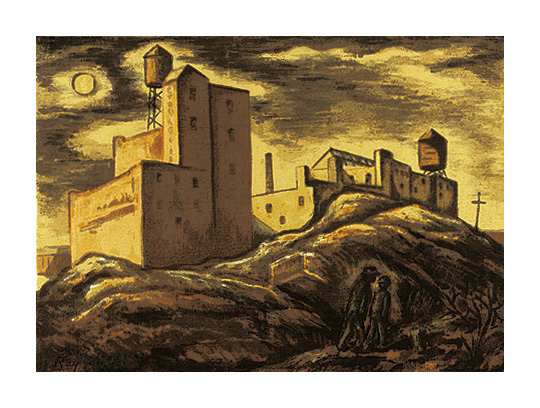 Nocturne - -c.1938, Color Serigraph. Edition small. Signed in pencil, in the image, lower left. Titled in pencil in the left center sheet edge, recto, and in the sheet center with the number 1, verso. Image size 10 1/4 x 14 1/8 inches (260 x 359 mm); sheet size 11 x 16 1/8 inches (279 x 410 mm). A fine, fresh impression, with full margins (3/8 to 1 1/16 inches), on cream wove paper. Traces of printing ink in the margins; a paper loss in the top right corner; otherwise in excellent condition. 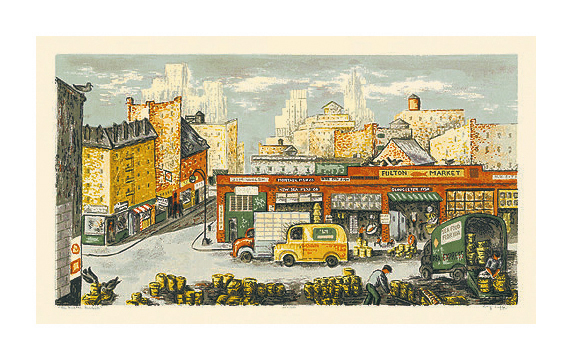 The Fulton Market - - c. 1940, Color Serigraph. Edition 350. Signed, titled and numbered 185/350 in pencil. Image size 11 x 20 inches (279 x 508 mm); sheet size 18 x 28 inches (457 x 711 mm). A fine, fresh impression, with margins (3 1/8 to 4 inches), on off-white laid paper, in excellent condition.